Last week, I participated as a parent representative in the K-5 work group for History and Government established by HB 1490. Immediately upon arrival in our meeting room, arranged by the Missouri Department of Elementary and Secondary Education (DESE), I was treated to what has become common behavior by DESE, and through them, school districts across the state. They assumed power and authority they are not granted by law. To this end, DESE committed a coup, thumbing their noses at the state legislature and the law they crafted in response to implementation of Common Core Standards. Common Core Standards were adopted unconstitutionally to begin with. Governor Jay Nixon signed Missouri onto them by illegally bypassing the state legislature, the only body with the legal authority to draft changes to Missouri’s education standards. The legislature didn’t seem to mind. In fact, a few short years ago thanks to DESE and corporate lobbyists, they voted to repeal Missouri’s higher standard for education to lay the ground work for Common Core. Literally, before my eyes, DESE and their agents completely ignored both the intent of HB 1490 and the language in the law that prohibited the organization’s involvement in the work groups convened to develop standards for districts statewide. They shredded HB 1490 and danced with glee on the litter. 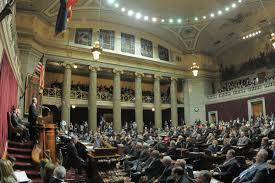 This complete and total disregard, for the state legislature and the parents, students and citizens of the state of Missouri was shocking. The audacity shown by DESE and the contempt they have for those who would require they follow the law, was evident in every work group. The fingerprints of tried and true tactics were evidenced in power point presentations and notes plastered on the walls of each work group. Like a door-to-door salesman, DESE wasn’t taking no for an answer. ‘Facilitators’ (fascists, for those keeping score at home) simply pushed on with the agenda handed down to them by DESE: Ensure that the Common Core standards remain in place, at all costs. Their illegal assumption of authority, of inserting themselves in a process they are legally excluded from, is the norm for the bureaucratic monster known as DESE. It has been reflected in school districts across the state, as they rush to transform our schools from institutions of learning into incubators of failure, designed to produce children ready for factory assembly lines instead of prepared for universities. The refusal for DESE’s ‘facilitators’ to step down resulted in my decision to leave the work group I was appointed to last week, rather than to willingly participate in committing a fraud against the people of Missouri. There has been much debate among the parents appointed to these groups about whether to continue to participate in a process that has been marked by illegal behavior. A growing number of these parent representatives have expressed the need to stand up, to stop the illegal process before it goes any further. Other parent representatives and educators appointed to these groups believe that they should press on, even though they are well aware that DESE’s continued involvement is illegal. These parents and educators believe that it is their duty to continue to participate and that there is some value in continuing to object, despite being repeatedly silenced through manufactured votes of contrived consensus. They believe that by recording this fraud as it is taking place, the public will respond with outrage. Instead, what has been shown with each call for contrived ‘consensus’, is that these parents and teachers are simply the minority in what appears to be a ‘democratic’ process. This is what DESE is counting on. The participation of these parents in the work group meetings, under fraudulent terms and DESE’s iron fist, simply gives the appearance of legitimacy. This is the biggest mistake these appointees could make. By participating in a process that is illegal, they are giving it a legitimacy it doesn’t otherwise have. Continuing to play by the rules as DESE has rewritten them makes these parents accessories to the very crimes they want to prevent. For these and many other reasons, I have withdrawn from my appointment to this process. To continue to participate with hopes that the rule of law will somehow be magically reestablished is a lie I am not willing to tell myself or my children. As I said Monday, September 22, when I made the decision to leave the work group session, it is a moral choice to continue aiding and abetting this sham, one that I am not comfortable with. It is a shame that so many of the other participants believe that it is justified to continue with an illegal process. Wishing on a star won’t stop the DESE agenda. I sincerely wish the parents, teachers and educators the best of luck in the days ahead. It is up to them whether they move forward legally or not. No one else is in the room. Diehl to Defund Common Core’s ‘Backdoor’? Today on news talk radio, State Sen. Diehl announced he will work to defund efforts to slide Common Core through the ‘backdoor’. I wanted to share the following reply to an email I received from a member of our work group. In it, I was asked about my motivation for objecting and subsequently leaving our session on Monday. After I wrote it, I thought it was appropriate to share with everyone, as I am sure many of the questions and concerns the author raised were echoed in the group, privately or otherwise. Certainly that is understandable. We don’t know one another. We come from different perspectives and, as the author said, we all have agendas or reasons for wanting to be a part of this important process. In that email, the author raised concerns about my actions Monday and wondered if my intent was to somehow sabotage or undermine the very task we are charged with performing: developing standards for schools that make sense for Missouri. The author also mentioned that they found it worrisome that there was a meeting of parent representatives Monday morning before our work groups were convened. They wondered if that spoke to an agenda that I might have been representing or pushing with my objections and ultimate decision to leave on Monday. Those are valid questions and certainly reasonable concerns. My reply to that is copied below with no alterations, other than to remove any reference to the author’s name. I felt that perhaps it would be beneficial to share my response with the entire group, so that no one has to wonder what my reasons were for leaving on Monday or what they are in accepting the appointment to this work group. My hope is that, by sharing this with all of you, perhaps you will have some insight as to my own personal motivations for participating in this group and to (hopefully) provide some insight into where I am coming from. I appreciate your taking the time to craft such a thoughtful response. Thank you so very much for sharing your view, experience and perspective, as well as your reasons for participating in this group. I am honest to a fault, I am afraid, and therefore will be as forthcoming as you were in your email. Yes, there was a meeting in the House chambers before we convened in the Truman Bldg. I was there for that meeting. In it, we received information related to HB 1490, including discussions relating to how our work groups were to function. What I mean by that is that the bill clearly states that the only participants in our sessions, while open to the public, are to be those 16 people appointed to the group. The intention of the bill, in my mind, was to enable us to function independent of agendas that aren’t our own. Each of us appointed to the group has an agenda and all of them (hopefully) have something to do with making sure that our kids future, and the health of our school districts, is maintained. When I arrived in our conference room, I saw our ‘facilitator’ and immediately balked. Not because I don’t believe we should have structure or leadership through our process, but because I didn’t believe (and still don’t) that person should be a representative of a bureaucratic organization. To me, it creates the perception that we are being led to a predetermined result which, in my mind is contrary to both the intent and the language of HB 1490. Additionally, I was quite sincere when I said that I believed that those appointees who weren’t yet seated should be present at the beginning of the process. That ensures that all of us who were appointed (honored, really….I believe as you do that this is an incredibly important charge we have received) were starting on this process in the correct way. That, for me, is important. Not simply to do the work we are assigned, but to do so in a way that is both consistent with the bill that formed our groups and ensures that all voices are heard and can contribute. Moving forward without them, in my mind, short changes the process and, as I said in our meeting, immediately calls our legitimacy into question. These concerns were not alleviated as the morning progressed. I am sure you remember hearing the request from one of our members that the facilitator give us a definition of ‘consensus’. I wondered if perhaps she would also provide the definition for ‘contrived’, as again, we were missing nearly a third of our group. Consensus, when you don’t have a fully seated group, is a hard thing to have. Particularly when we weren’t even sure at that time that all our members were informed of our meeting. I later found out that not all of the appointments have been made, which further raises questions in my mind about moving forward under those circumstances. You spoke to the issue of agendas. I was rather clear about mine. I represent not only my kids in that room, or a school district. I represent an entire rural farming community. The heart of our town is our school, and moving forward with standards that appear to be designed to drive test scores down (as you mentioned with some of Common Core’s age appropriate issues will almost certainly do) is a very real concern for small districts like ours across the state. Smaller districts have unique challenges, as I am sure you are well aware. Accreditation is at stake for districts like ours….all districts for that matter, and our town’s livelihood depends on maintaining and preserving our school. I understand your perception that I was perhaps trying to sabotage the process with my repeated objections, but I assure you, that wasn’t the case. I simply wanted to ensure that all voices that are supposed to be in our group were afforded the opportunity to participate. Video taped meetings are great, if you would rather dictate instead of inviting people to participate. Those videos will certainly help bring absent members up to speed, but they won’t allow them to contribute. That, for me, is a sticking point. Alarm bells went off for me when that simple consideration for absent members of our group was ignored in favor of steam rolling ahead with the process. That smacks of the same tactics that were used to implement these standards in the first place, and were being led by a political subdivision of the Governor’s office….the same Governor who signed us up for these standards and bypassed the Constitutional role of our legislature in the process. It appeared to me that we were being led to a predetermined conclusion and, come hell or high water, we weren’t going to be allowed to go off script. Local control of our school districts is the single most important aspect of government. Attempts to bypass or undue this is, in my opinion, the single greatest threat to students, parents and teachers that we currently face. Truly, I wasn’t on a mission to create issues for the sake of it or because someone directed me to do so. I simply didn’t want to check my principles at the door for the sake of moving on just to move on. I want to do this right, without influences over our direction and with participation by all of those appointed to do so. I hope that helps to provide some insight into my actions. I cannot speak for anyone else, but those are some of the reasons I felt as strongly about this as I did, and still do. I greatly appreciate the chance to share with you and am confident that we can work together to craft standards that make sense, even if we don’t all agree on every point. Thank you again for the opportunity to exchange views and I promise you, I have no intention whatsoever of using your comments in any sort of negative way. I am guided by my principles, sometimes to a fault (as you witnessed for yourself on Monday), and I have no doubt that you have the best interests of our schools and kids at heart. That, is the most important quality any member of our group can demonstrate. I look forward to sharing more with you and learning from you as we move forward. I hope that you have found that, contrary to popular belief and my wife’s opinion, I wasn’t trying to be a pain for the sake of it or because someone put me up to it. My decision to leave may well result in the Speaker of the House, Tim Jones, deciding to replace me in the work group I was appointed to. As it was explained to me, my boycott of Monday and Tuesday’s meetings didn’t reflect well on Jones, politically. I would counter by saying the Speaker should be thrilled that someone cared enough about the bill his legislature crafted to want to see it followed, but that’s just me. I’m a guy with Occupy Wall Street roots. I’m used to being in the silenced majority.